You're So Post-Post-Rock Right Now | WAYO 104.3FM Rochester, NY | Way out, right here. You're So Post-Post-Rock Right Now is the place where indie and classical collide. Daniel Kushner brings you an eclectic mix of contemporary classical, indie, folk, and avant-garde music. Explore unexpected musical connections, check out engaging interviews with local artists, and enjoy live studio performances as well. On the February 20th edition of You're So Post-Post-Rock Right Now, Musical Tarot returns with a playlist inspired by the Major Arcana card "The Emperor." Host Daniel Kushner plays songs about fatherhood, protection, and stability from the likes of The Magnetic Fields, Johnny Cash, Ben Folds, The Beach Boys, Baby Dee, Conor Oberst, Sons of an Illustrious Father, and more. It's Black History Month, and I knew I wanted to honor the late 20th century African American composer Julius Eastman, a wildly creative and provocative force in the world of contemporary classical music. On the 50th episode of You're So Post-Post-Rock Right Now (February 6, 2017), I switched from piano to strings: music by Andrew Bird, Owen Pallett, Micachu and the Shapes with the London Sinfonietta, Philip Glass, Nico Muhly, and more. Electroacoustic, avant-garde, indie, classical--all with string instruments at the fore. For the January 30th edition of You're So Post-Post-Rock Right Now, I decided on a piano-centric playlist, featuring new music from Chris Thile & Brad Mehldau, Dirty Projectors, and Father John Misty, along with songs from Fiona Apple, Christopher O'Riley, The Bad Plus, and Ben Folds Five. Poignant, emotive vocals. Virtuosic playing. The odd twinge of grunge in the morning. This episode--broadcast from the WAYO 104.3 studios in Rochester, NY--has all that and more. On Martin Luther King Jr. Day (1/17/16), Thunder Body returns to You're So Post-Post-Right Now and the WAYO studios to play some grooving tunes, talk about the legacy Martin Luther King and racial issues in America, plus give a preview of the remaining Medicine Wednesday shows at Flour City Station on January 19 and 27, respectively. Prior to the January 9th episode of You're So Post-Post-Rock Right Now, I visited Ben Proctor's History of Rock 'n' Roll class at Fairport High School, where we listened to originals and their distinct cover versions, side by side. Happy holidays! It's the third night of Hanukkah and the day after Christmas, so the December 26, 2016 episode of You're So Post-Post-Rock Right Now features festive and winter-related music from Kate Bush, Sufjan Stevens, Saintseneca, mewithoutYou, Bryce Dessner, and David Lang. Plus, it's also "Musical Tarot" this week, so the tunes focus on the the theme of boundless innocence and wide-eyed wonder, inspired by the Major Arcana card "The Fool." 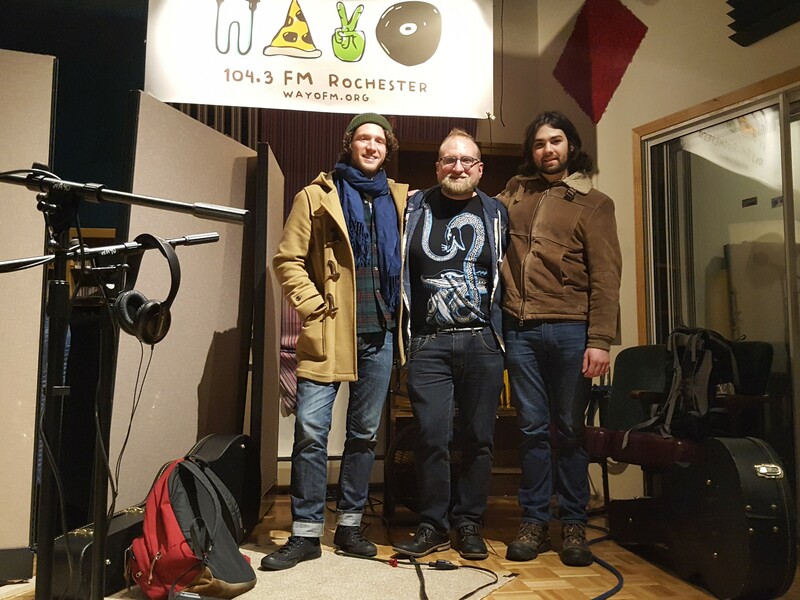 On the 43rd episode of You're So Post-Post-Rock Right Now (December 19, 2016), Alex Cote and Alex Patrick of the Rochester rock/blues band Dangerbyrd joined host Daniel Kushner and guest co-host Dave Kyle for a live studio performance and interview. The duo Alex discussed the origins of Dangerbyrd, being a part of the Rochester music scene, and the release of the Dangerbyrd EP/ This episode also features classic and contemporary blues-tinged rock songs performed by Eric Burdon and the Animals, Bob Dylan and The Band, Ryan Adams, Jeff Buckley, and Father John Misty. In this episode of You're So Post-Post-Rock Right Now, host Daniel Kushner plays his favorite musicians to hear live in concert. Ranging from folk and progressive bluegrass to classical to rock and even a hint of jazz. Featured artists include Sigur Ros (Jonsi pictured here) Joanna Newsom, Punch Brothers, Yuja Wang, My Brightest Diamond, Father John Misty, mewithoutYou, and more.